As you already know…or as you’ll soon figure out..you will find these handy dandy ways to make your kid shut up. Okay that was harsh. 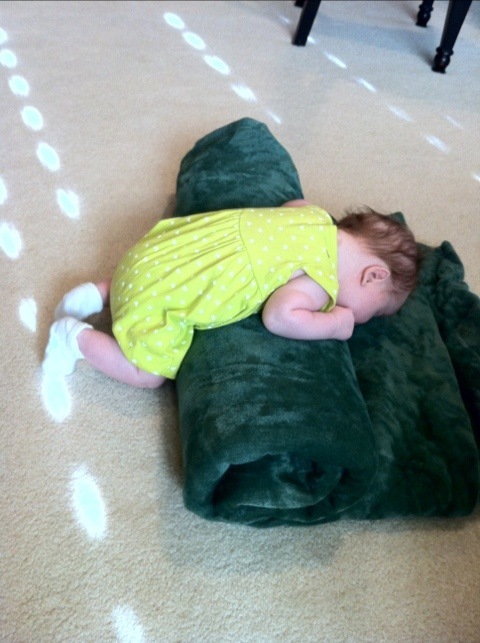 But really…sometimes you just find things that your baby loves. These things may be odd. They may be unconventional. They may make you look like a complete bafoon. BUT trust me, you will do this whole dog and pony show to make that sweet smile appear and to scare away that little person screaming at you! BOUNCING. Okay, so you think that’s fine. But people, we are talking EXTREME bouncing. The kind that other people would be scared to do with a baby not of their own flesh. Harper likes motion. LOTS of motion. And not that mamby pamby rocking stuff yo mamma did back in the 80s. Listen. This kid could probably break into a bank and steal ya gold coins. She can break out of a swaddle like it’s nobody’s business. You know what happens when babies break free from their swaddles? THEY ATTACK THEMSELVES!!! What? Yes. Attack. Everytime I find her arms free in the morning, I usually see the battle wounds on her poor sweet face! Those claws are ruthless. 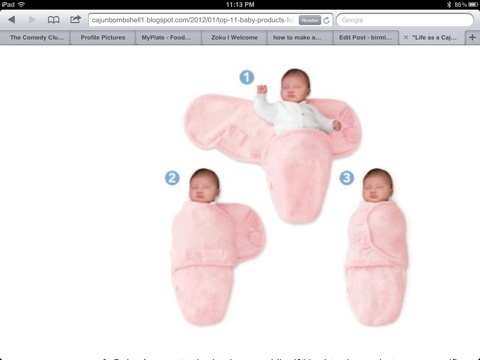 Sooooo…we will swaddle her once. Swaddle her twice. 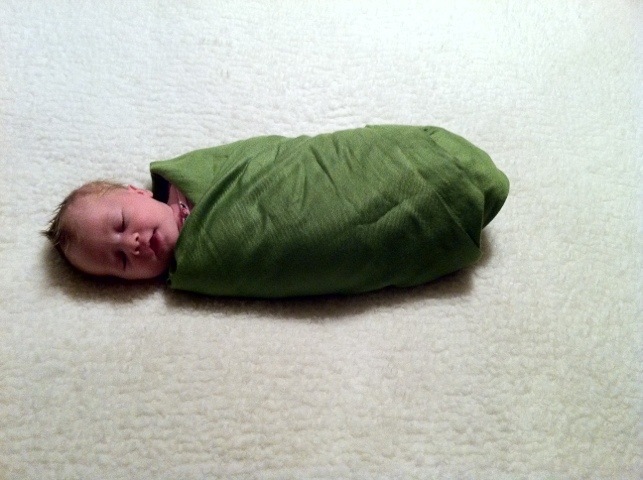 AND put her in one of those fancy swaddle things sold in stores… see photo below. 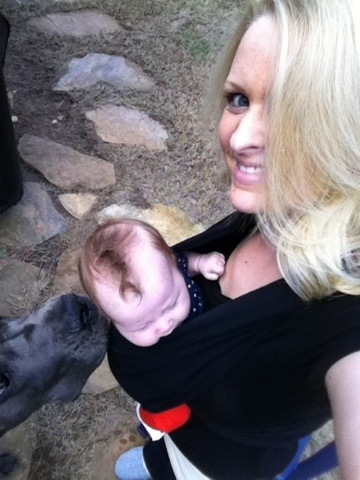 If all else fails…FLIP THE BABY!!! 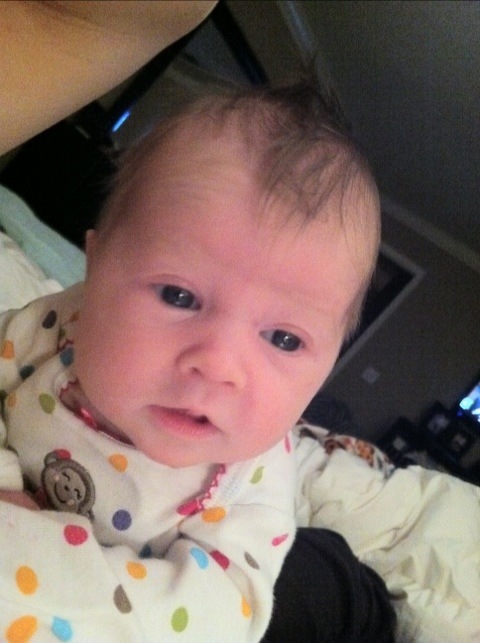 If Harper is yelling at me…she’s fed, burped, bounced, kissed, etc…and doesn’t stop…I’ll FLIP HER OVER! She will lift her head up and stare at “Mr. Light”. He’s a lamp beside my bed, and she is entranced by him. It works half of the times! As for the others…we try the rest of our tricks! Okay…I have spent several of my trips to the store, the zoo, the playground, etc…pushing a crying baby in a stroller. Apparently my legs cannot create the same exact motion feelings a 2010 Nissan Cube can make. 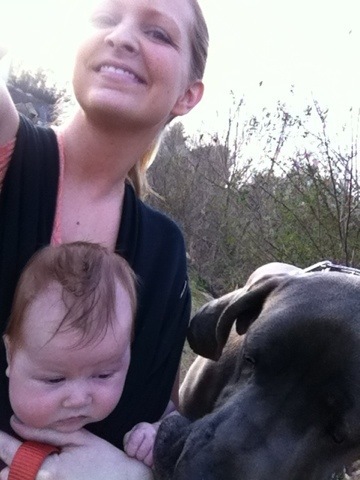 SOOOOOO I decided to be one of those baby wearing moms. LOVE IT. And so does Harper. We got the Baby K’tan a week ago and tested it out with a brief walk with the Sergeant. It was…sort of a success. I was wearing it wrong. I’m sure our neighbors were peering out the window whilst on the phone with children’s services reporting me for having a lop sided baby on my chest…but whatevs. NOW we have it down pat! The instructions were missing in my box, SO I obtained a set and we are all good now. 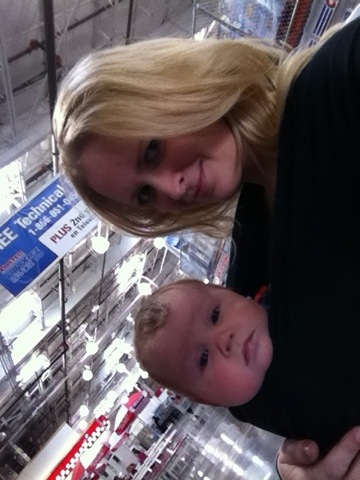 We had a GREAT trip to Costco today. 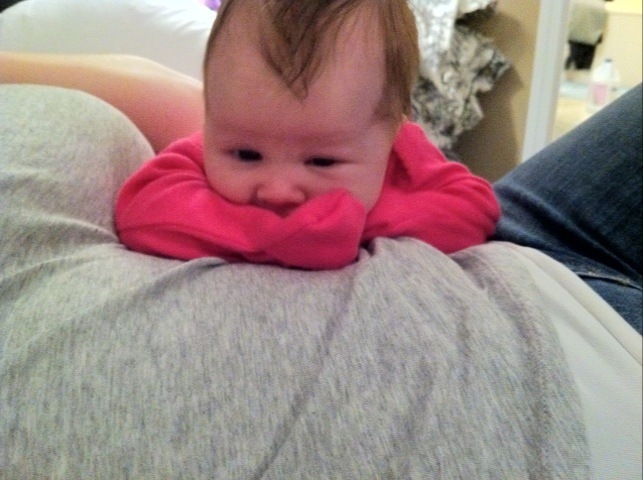 Harper was totally into looking at everything AND everyone! It was lovely! THIS- MY FRIENDS- IS A NEW TRICK. 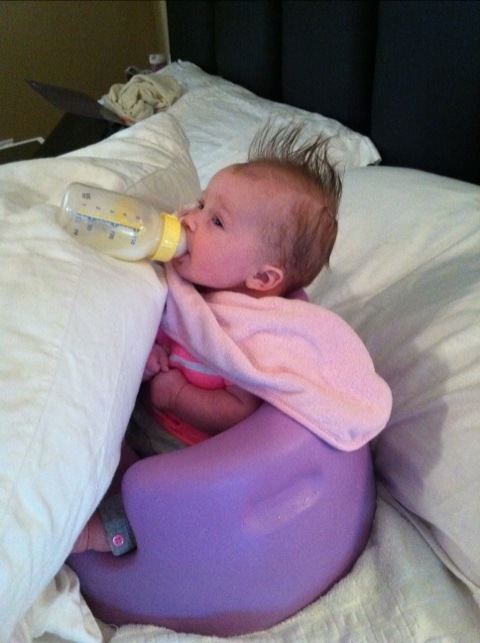 I call it…the bumbo, pillow, burp cloth, bottle holder-upper. I needed to do a couple things in the same room (because you never leave a baby unattended while a bottle is propped up) soooooo…I did this little jazzy trick! NEAT-O. She is very cute!!!!! And i totally understand the multiple ways to soothe a baby! wow I think your tips are brilliant! Might try those for my little girl. Wish me luck! Cute pictures by the way. 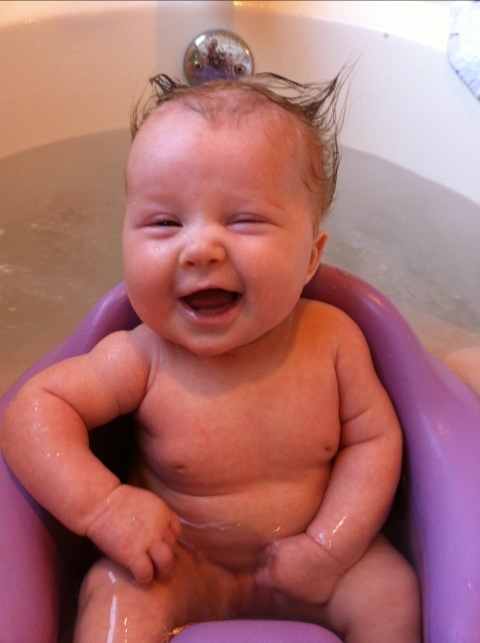 ♥ your baby’s picture should be included here: http://www.babypics.com/pics/a91 you think so, yes? 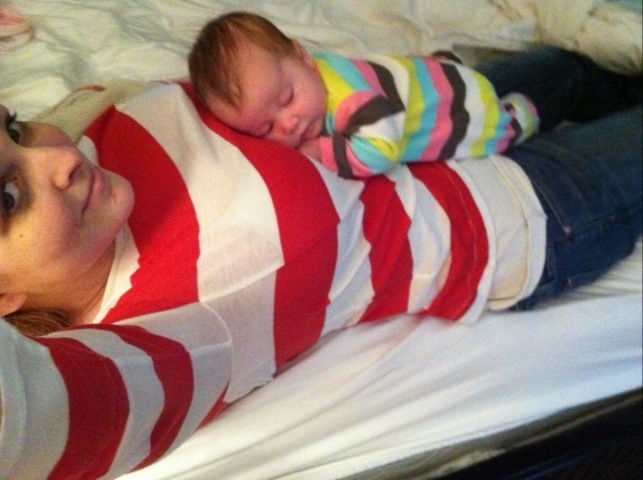 Awe, so cute! 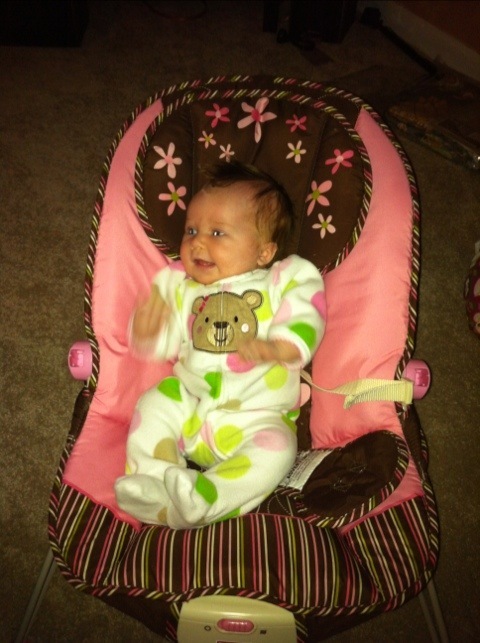 Does she really like the bumbo? I’ve gotten mixed reviews on it and am contemplating adding it to my registry.